A Desire Line (or Desire Path) is the shortest or easiest way to get from where you are to where you want to be. In the physical world we can see these in parks or grassed areas as paths worn away by people’s feet. This was taken not long after the opening of a new building. The photo shows part of an entrance area to an office building and mall entrance. 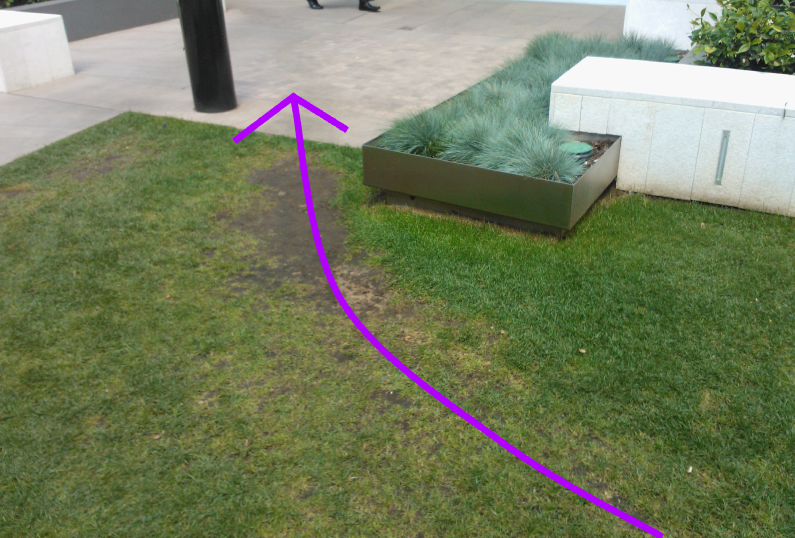 The arrow shows how a Desire Line has been worn away in the grass. Even though the distance to walk around the small grassed area is probably no more than an additional metre or so, the easiest and quickest way is to just take a shortcut across the grass. 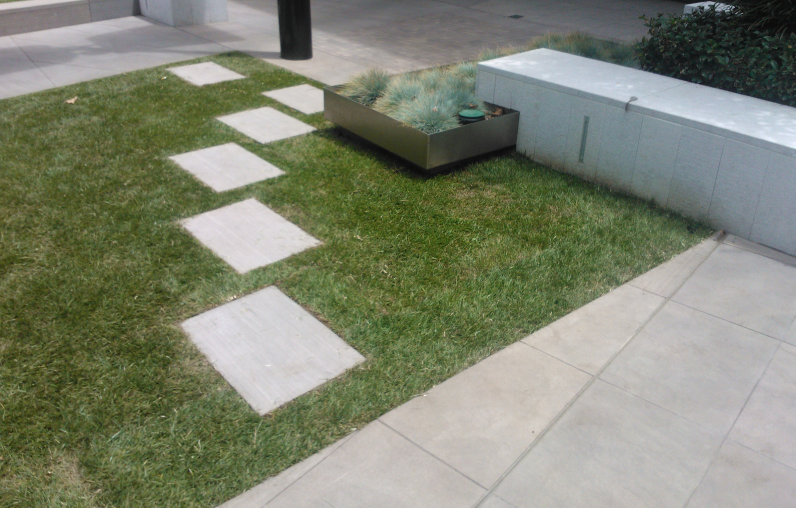 Small slabs have been placed along the Desire Line, possibly to improve the “prettiness” of the area. It looks like there may also have been some attempt to match the type of stone to the surrounding paved area. It still however looks out of place. This “fix” will be of benefit if the weather is wet and will stop people who use this route getting muddy feet. So in that respect it will have some useful function. One way to think about Desire Lines in designed spaces (as opposed to larger “natural” spaces such as parks, etc.) is to think of them as design failures. The appearance of the Desire Line shows that either that pedestrian traffic flow may not have been considered and designed for; or that aesthetic considerations may have trumped it. Regardless, the way that people wanted to use the space (i.e. the users) was different to how the space was constructed. We can use the concept of Desire Lines in software development. By thinking in a “user centric” way, involving the user, and/or performing usability studies we can at least hope to discover the potential Desire Lines in software. By doing so we can change our user interfaces to accommodate the user flows so they don’t have to feel like they are fighting against the software. Next time you’re walking around your city or local park, see if you can spot any Desire Lines. If you’re interested in learning more about design principals, feel free to check out my Pluralsight Introduction to Design course.